Bicycles that are part of the NYC Bike Share program are lined up at a dock and lock station at the Brooklyn Navy Yards in New York. Citi Bike said the issue affects the front-wheel braking system in markets with e-bikes operated by Motivate, which was acquired by Lyft last year ahead of its initial public offering. Lyft is reportedly planning to launch its own e-bike model soon. Roughly 3,000 electric bikes are being pulled from service across the three regions, where Lyft also operates around 17,000 traditional bikes for sharing, Reuters reports. E-bikes that are currently docked will not be able to be rented for service, the news service added. Citi Bike said in a blog post that the issue involved “stronger than expected braking force on the front wheel.” As anyone who has ever been on a bike likely understands, braking on the front wheel with too much force can send the rider flying over the handlebars or at the very least result in a tumble. 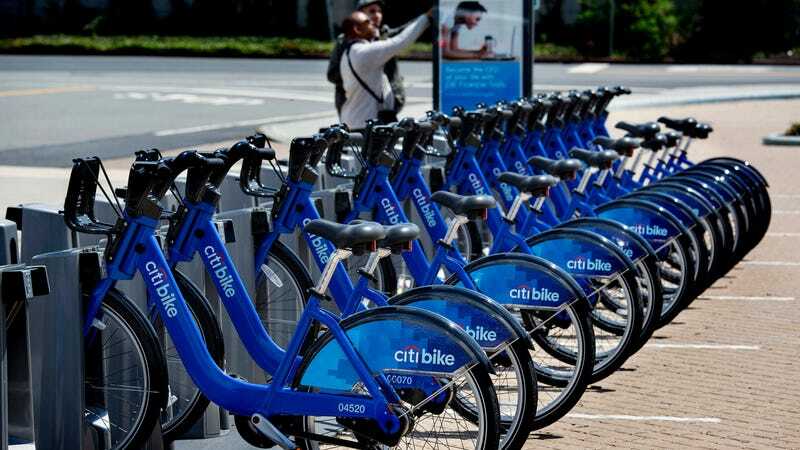 The Citi Bike spokesperson said that the company secured an outside engineering firm to identify the cause of the issue, but in the meantime, it is working to replace e-bikes with regular bikes to avoid service interruptions.